The Four Seasons Resort Marrakech is a private resort paradise situated in the “red city” in front of the Menara gardens. Created in 2011, this resort welcomes the travellers in 16 hectares composed of a variety of plants and flowers such as palm trees, olive trees and hibiscus. 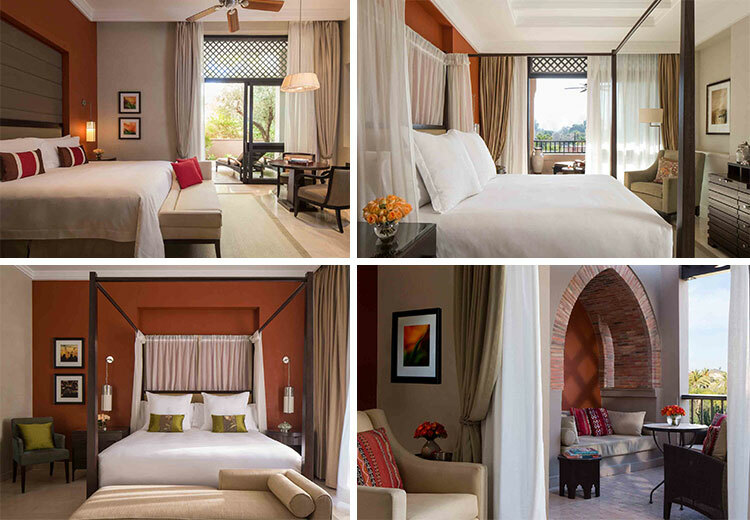 Inspired by the Moroccan architecture, the Four Season Marrakech is composed of riads and brown small buildings. The decoration is very modern with a touch of Moroccan style. Just 10 minutes away from the Marrakech-Ménara International Airport by taxi, the Four Seasons Resort Marrakech has 141 rooms and 27 suites decorated in the same contemporary and chic style with some Moroccan details. Endowed with a dressing space allowing you to tide your personal stuff, you will enjoy your stay with all the necessaries comforts. Rooms are also furnished with a flat screen television, air conditioning, IPod & IHome station, minibar, safe deposit box and Wi-Fi. Bathrooms, like the rooms, are spacious with a big bath and an Italian styled shower. The whole atmosphere is very pleasant, bright and roomy. 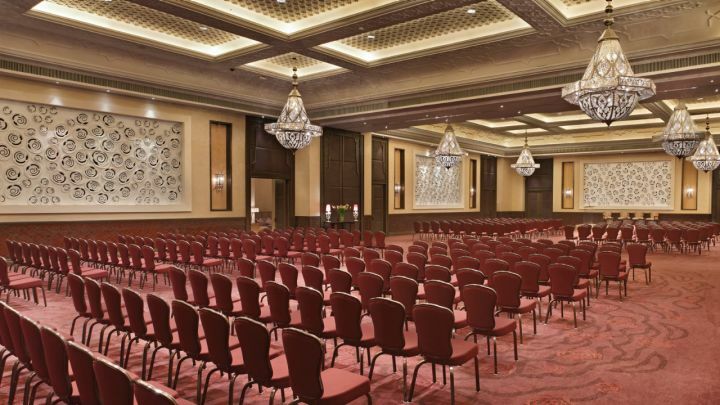 Ballroom Agdal is located within the conference center. 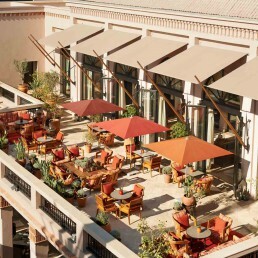 The Four Seasons Hotel Marrakech offers 2,115 square metres of meeting and function space. The three adjacent breakout rooms have natural daylight. The hotel resort has two outdoor banquet spaces: the outdoor lawn composed of a central lawn surrounded by palm trees and the patio having an ornamental lake in the middle. The Four Seasons spa offers a variety of body care and massages to hotel’s clients. Face care are proposed, but also scrubs or body wrapping. More than 15 rooms are available and benefit from a private terrace access. You can also relax in the Hamman, sauna or whirlpool bath. To be in good shape, the Four Seasons Marrakech has its own fitness center separated in two rooms. 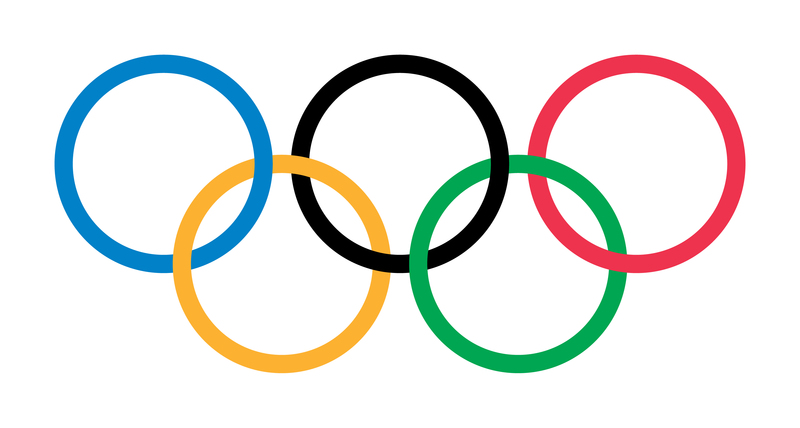 One space is dedicated to cardio-training and the other one to mat exercises. After your training at the fitness centre, you can enjoy the tennis courts dedicated to the hotel guests. Situated next to the fitness centre, the clays are enlightened by night. A relaxing swimming pool accessible by adults only, is the perfect way to take a breath and enjoy a peaceful environment. In an idyllic setting the resort offers individual or group yoga classes with guru Manoj Uniyal to nourish your body and soul. In a city known for culinary richness, Four Seasons Resort Marrakech puts stylish fine dining restaurant choices at your door. 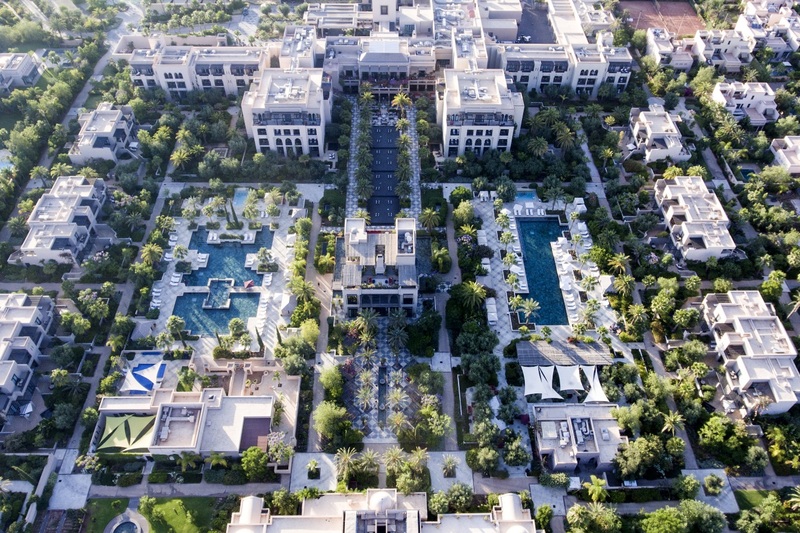 Enjoy the flavours of Mediterranean cuisine at Azzera, savour Italian gourmet dishes at Solano or share cocktails and Middle Eastern mezze in the comfort of Inara. The “Bleu d’Orange” building located in the heart of the resort and the palm groves and gardens, offers 3 spaces on different levels: the ground floor restaurant for diners seated, 1st floor a great bar area for your evening entertainment and cocktail parties ; the 2nd floor a roof-top bar ideal for appetizers, friendly open-air lunches. 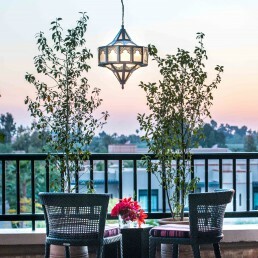 Open when weather permits, the rooftop lounge, set atop Bleu d’Orange in the centre of the Resort, creates an atmosphere of chic relaxation, with spectacular views of the Atlas Mountains and breathtaking sunsets overlooking the Menara Gardens. This area can host 50 seated person. In a casual setting overlooking the Resort’s adult pool, Azzera features a fresh selection of grilled meat and fish specialties, while an à la carte menu includes an assortment of sandwiches, snacks and international favorites. The restaurant’s alfresco setting provides a perfect place to enjoy a casual lunch or an ice cream treat between laps in the adjacent pool. This area can host 80 seated person. Located in the lobby, Inara offers intimate indoor and outdoor settings for guests to enjoy light meals, Middle Eastern mezze and cocktails throughout the day. As one of the Resort’s best meeting spots, Inara is the place to see and be seen in Marrakech. This area can host 30 seated person indoor and 25 outdoor. Quattro offers a diverse selection of international breakfast buffet items as well as traditional Moroccan breads and pastries, along with made-to-order classics like Eggs Benedict. For dinner, Quattro transforms into a romantic dining room where you will be able to taste a menu highlighting the excellence of the Southern Italian cuisine.